Compare Robo Advisors in the UK - Includes Fee Calculator! Robo-advice fee comparison tool. Hover over a number for a more detailed breakdown in the tooltip. Contact me if you’d like to embed it in your financial site/blog. Use the comparison tool above to compare fees for the UK’s Robo Advisors. Fees are calculated to the best of our knowledge and the latest data provided by the companies themselves. Please confirm before making an investment. Robo advisors hope to fill the role of a traditional investment advisor. Using technology they can create an optimised, low-fee portfolio based upon your personal circumstances and tolerance for risk. For those of us with moderate savings, fees are generally much lower than they would be to employ a financial or investment advisor to do this for you manually. Screenshot from Moneyfarm (read more about Moneyfarm here). In general, when you first register they ask you to fill out a questionnaire to understand your investment goals and tolerance for risk. They then use this to build an investment portfolio for you. Very roughly, if you have a lower tolerance for risk they would assign you a larger proportion of bonds, gilts and less volatile investments. If you were young, with a long investment timeline and high tolerance for risk, you would be assigned a higher proportion of stocks, perhaps more emerging market or higher ‘risk-return’ options. In general, Robo Advisors then buy low-cost ETFs to invest your deposit according to your risk profile. I’ve reviewed one of the Robo-Advisors in detail after several months of investing with them. 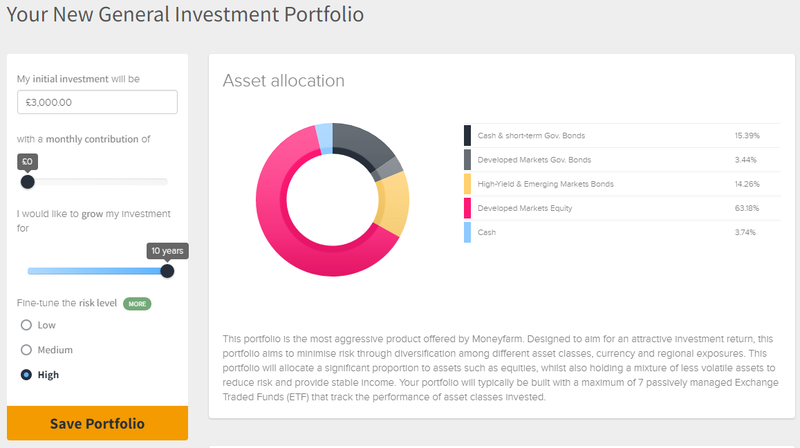 In this review, I compared how investing in Moneyfarm differed to a traditional stocks and shares broker like TD Direct Investing. Robo advisors are still in their infancy in the UK, but they have a huge potential. Many people are open to investing in the stock market but do not have the time or experience to do it themselves through a traditional broker. Robo advice platforms now allow them to do this in a cost-effective way. Whats more, tax efficient accounts like stocks and shares ISAs or the new Lifetime ISA are perfect to hold investments without having to pay tax on the income. With changes to the way we manage pensions, robo advisors are becoming a more attractive option to traditional ways of managing the pension fund that may have been perceived as high-fee or less transparent. I’m more optimistic about the long term viability: once savers have invested a couple of years ISA allowances or transferred their SIPP how likely are they to move it? The article you linked to says Nutmeg manage £500m in funds – at say an average of 0.5% fees that’s a reasonable £2.5million a year in fees.